Oliver Stone used to rock us out of our seats and blow our minds (“JFK,” “Nixon”), but I think that fire within him is past now. Snowden is a tempered, yet always compelling piece of storytelling by Stone, on one of the biggest stories of this century. 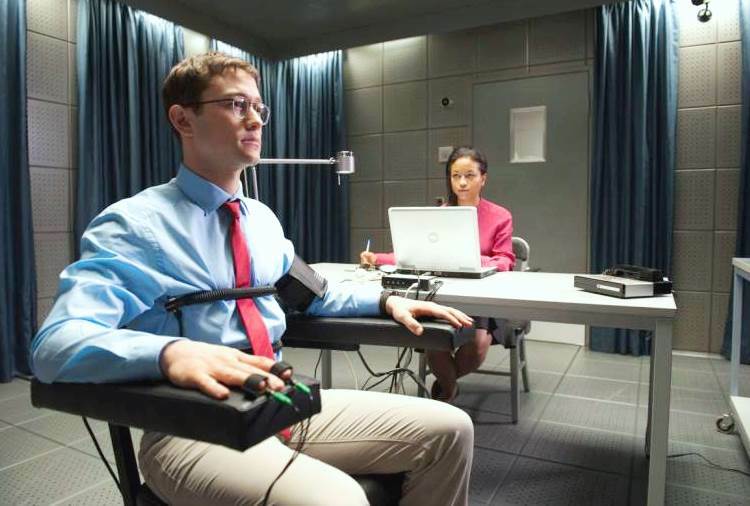 Edward Snowden (Joseph Gordon-Levitt, in persuasive braniac mode) is the famous whistleblower who leaked to every common person in the world that all of our web data and online searches, the cameras on our phones and laptops, had been used by the CIA to spy on us. I think we can say that we all considered in years past, “Hey, somebody could find out what we look at on the internet!” but that we naively persisted with our activity, uploading “private pics” and doing web searches on people we probably shouldn’t do. The texts and emails were never private, either. There really was no wall of privacy when you’re on your computer, with an optic nerve recording you. Because of Snowden’s whistleblowing, who lives in refuge now in Moscow, the laws of data collecting have since lightened up through restrictions. 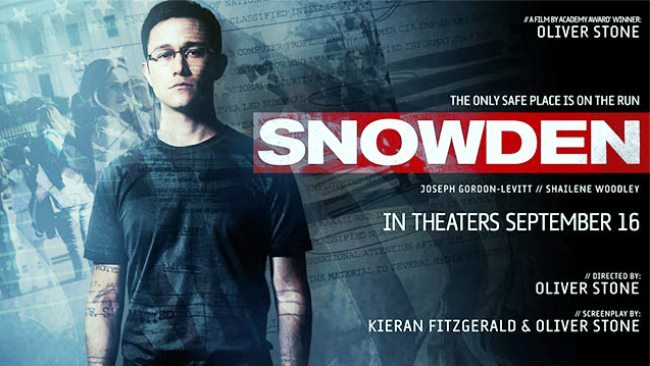 There certainly is a wealth of information in “Snowden,” and it’s certainly the kind of political movie that shows how intelligence operations work from the inside. Stone attacks the story by covering the adult life of Snowden from Army Reserve reject to CIA cyberhacker. His boss Corbin O’Brien (Rhys Ifans) tells Edward that twenty years from now “Iraq will be a hellhole no one cares about,” and that the real contemporary war is against China and Moscow and the battleground is cyberspace. In Switzerland, on field assignment, Edward is revealed to be lousy at schmoozing with affluent figures to gain information of intelligence. But we later see how internet data, alongside setting a respectable person up with bad friends, can destroy an individual. Later on, we’re watching drone attacks in the Middle East where targets are wiped out by identifying their location on cell phones. Edward keeps all of this secret from his girlfriend love, Lindsay (Shailene Woodley), a liberal and artsy free-spirit who believes the Iraq War is a corrupt disaster and that George W. Bush is Satan. They have a long relationship, but it’s never tested more thoroughly then when they’re in Tokyo. But besides from the bickering, it’s the least memorable section of the movie only because at this point we feel Edward is working around the clock inside a dungeon of computers. When the film relocates to Oahu, where Edward gets a raise, the locations are chirpy and sanguine in comparison. Yet it’s there where Edward really refocuses on what he’s doing, and on his sold out integrity. It’s a violation when he learns his boss is spying on Edward’s girlfriend, and it’s not a relief to hear that she’s not cheating on him – not when Edward never asked him to spy on his girlfriend. What “Snowden” does a better job emphasizing than “Citizenfour,” the 2014 documentary with the real Snowden talking directly to the camera, with how clandestine his movements had to be when hiding in Hong Kong, hiding of course from authorities who could have extradited Snowden and charged him as a traitor in the States. And how spy-like (even Jason Bourne-like!) he had to act in order to get out of there and into Russia. Hong Kong was where he leaked everything to three journalists (played by Zachary Quinto, Melissa Leo, Tom Wilkinson who plays an esteemed veteran at the London based paper The Guardian), and they all beguiled by Edward’s genius and courage. I wished Stone had made these scenes longer so Edward could discourse more of his genius to the audience. There’s quite a few electric sequences by Stone. I wanted more. Maybe it’s absurdly childish of me to say, “I wished Oliver Stone risked it all like Snowden!” I might be one of the few that preferred Stone’s ability to produce fevered and stormy wealth of information, that I became seduced in his classics by his blending of different film stocks, shock cuts, highly stylized lighting, the different sound mixers on the soundtrack, and the general kaleidoscopic sensationalism of it all (Stone could put you everywhere at once). But although my emotions were tempered, I was absorbed by this truly important docudrama, one that’s almost more milestone than docudrama. Film Cousins: “The Conversation” (1974); “The Falcon and the Snowman” (1985); “The Insider” (1999); “Citizenfour” (2014).